A correctly repaired pitchmark will recover in 24 hours. An unrepaired pitchmark left unattended for two hours will take up to two months to recover. Despite the wintry weather returning to the Links in recent days there have been a few sun kissed days and enough light stretching past 5pm to make many of us think about getting back out on the course. 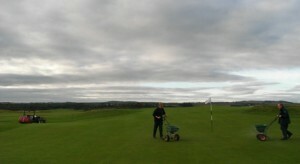 At this time of year increased play inevitably leads to more pitchmarks being left on greens. 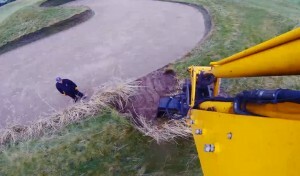 This is largely down to the wet weather in the winter time when ground conditions are naturally softer. However, the increased number on surfaces is also as a result of golfers not repairing them. Many golf courses in the UK face this issue at this time of year and it’s a cause for concern with the additional problems pitchmarks can bring. The increased numbers arise despite golfers in every Clubhouse in the land often being heard to remark, “Why can’t people repair their pitchmarks?” Everyone you talk to always claim that they repair 3 or 4 on every green! 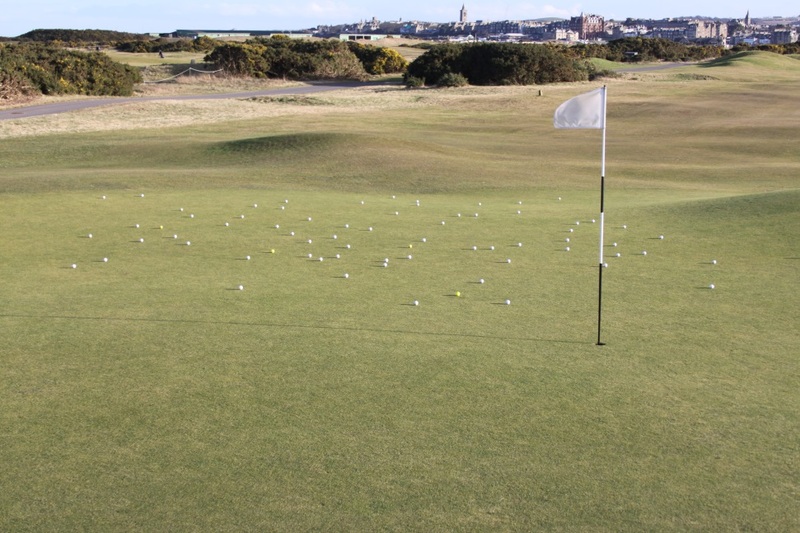 Recently, I took a bag of practice balls out to some greens and placed a ball in each unrepaired pitchmarks. Having only 75 balls, I ran out before I had covered even half of the green in both instances! The header image (above) shows the 8th green of the Eden Course where the slope at the front was worse for pitchmarks than the main part of the green. 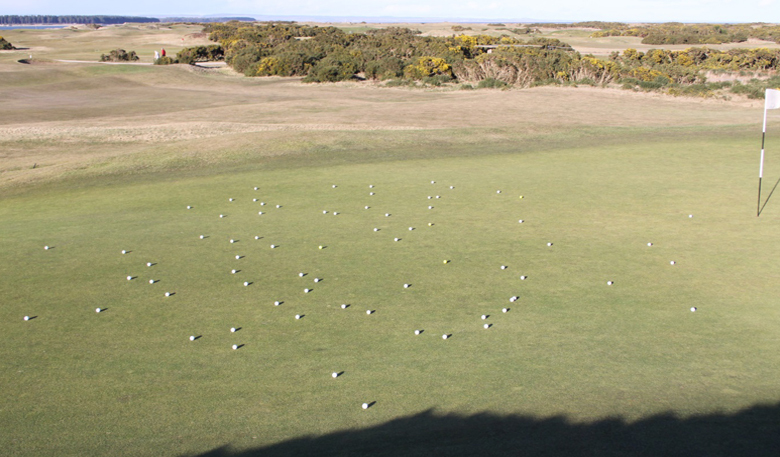 The image below shows the 1st green on the Eden where 75 balls only covered the pitchmarks on 25% on the green. 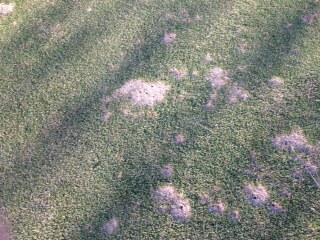 Unrepaired pitchmarks also foster disease and infections in the green as any gaps left in the turf will be filled by Annual Meadow Gras. This is a much weaker grass type than the favoured fescues and bents we encourage and is much more prone to disease attacks. On the Links we had some severe attacks of Fusarium disease back in November due to the exceptionally mild and damp weather at the time and it was the Annual Meadow Grass within the sward which was worst affected. 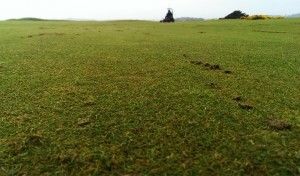 Below, you’ll see disease scars on the New Course caused by Fusarium patch disease. 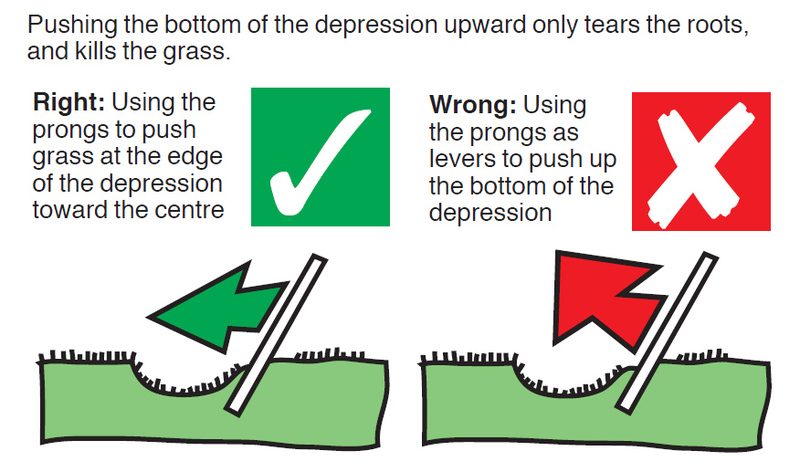 When it comes to repairing pitchmarks there is a right way to repair that really aids their recovery and there are many diagrams available online for Golf Clubs to display on notice boards.